PLEASE NOTE: Broderie anglaise dresses are currently out of stock. 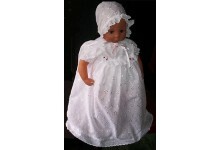 These lovely christening dresses are perfect for imaginative play. They're the perfect gift, and can also be used in Junior Church, christening preparation, or in school RE lessons. Made in England, so you are supporting independe..